In addition to existing benefits, such as strategic geographical location, duty-free exports to the countries of South Eastern Europe and Russia, the lowest corporate tax rate in Europe of 15% as well as an educated and skilled labor force available at competitive cost, Serbia has prepared a package of financial support to investors. The funds may be awarded for financing investment projects in the manufacturing sector and the services sector which may be subject to international trade. 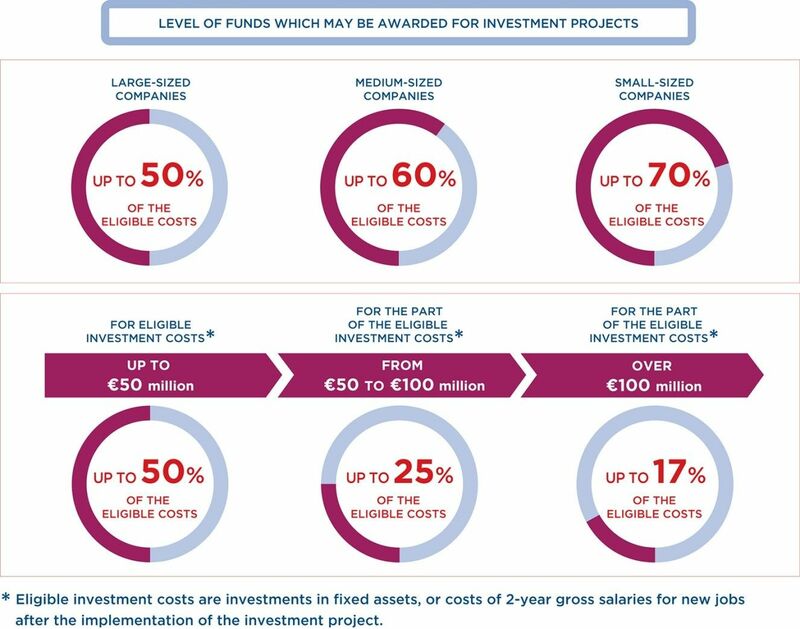 Eligible costs are investments in tangible and intangible assets, as of the date of applying for state grants until the deadline for implementation of the investment project, in accordance with state grant contract or gross salaries for new employees associated with the investment project during two years period after reaching full employment. Leasing of business premises are taken into account as an eligible investment costs in which the investment project is implemented, provided that the period of lease, from the completion of the investment project, is not less than five years for large enterprises, and not less than three years for small and medium businesses. the realization of the project, without which allocating funds could not be achieved. Not to reduce number of employees at the Beneficiaries after the implementation of the investment project, over a period of five years for large enterprises, and three years for small and medium enterprises. User of state grants, upon reaching full employment, in accordance with the agreement on the allocation of the incentives is obliged to pay the agreed salary to every new employee regularly, in accordance with this Regulation. For investments of special importance, the deadline for implementation of investment projects and creation of new jobs associated with the investment project, is up to ten years from the the date of applying for state grants. Investment projects in the agriculture and fisheries sector, in which the minimum value of investment is EUR 2.000.000 providing at least 25 new jobs. Incentives for eligible costs of gross salaries for new jobs – 20% (for the I of municipalities), 25% (for group II) and 30% (for group III), 35% (for IV group) and 40% (for devastated regions) the eligible costs of gross salaries from the Article 3. of this Decree. These amounts are limited to a maximum of 3.000 (for group I), 4.000 (for group II), 5.000 (for group III), 6.000 (for the IV group) and 7.000 euros per new job created (for devastated regions). Incentives for eligible investment costs in fixed assets – an increase in the amount of grants may be approved for: up to 10% (for I group of municipalities), 15% (for II group of municipality), 20% (for III group of municipalities), 25% (for the IV group of municipalities) and 30% (for devastated regions). 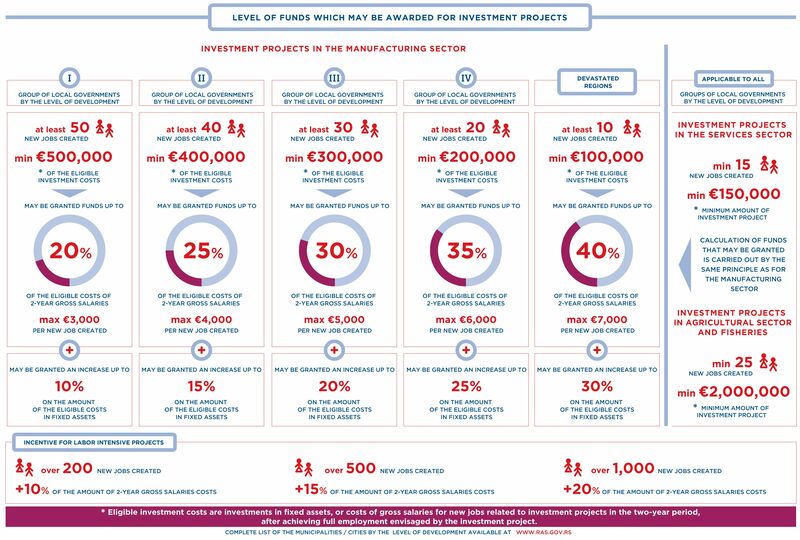 Additional incentives for labor-intensive projects – an increase in the amount of grants may be approved for: 10% of the eligible costs of gross salary (for any increase in the number of new jobs created over a number of 200 new jobs), 15% (for any increase in the number of new jobs created over a number of 500 new jobs) and 20% (for any increase in the number of new jobs created over a number of 1,000 new jobs). The total amount of funds that may be awarded in accordance with this Decree and other incentives is determined in absolute terms, having in mind that the upper limit may not exceed the amount that is allowed to assign the state grants, in accordance with the regulations governing the rules for granting state grants. The maximum amount of funds that can be allocated for attracting direct investments shall be determined in accordance with the regulations and criteria of this Decree. In determining the amount of funds that can be allocated, the cumulative pre-approved state grants are taken into consideration, in accordance with the regulations governing the rules for granting state grants. The procedure for allocation of funds: The allocation of funds shall be conducted in accordance with the Public Call and this Decree. Ministry of Economy, with the consent of the Ministry in charge of finance, publish this Public Call on its website. The Public Call is also published on the Agency’s website. The investor shall submit to the Agency a Letter of Intent on realization of the investment project. Based on the Letter of Intent, the Agency shall submit a notice to the investor about the possible level of incentives, leaving them 30 days to comment. After receiving their decision, the investor shall submit to the Agency an application for the allocation of the incentives on the prescribed form, in Serbian language. Funds can not be used to finance investment projects in the transport sector, software development, hospitality industry, gambling, trade, production of synthetic fibers, coal and steel, tobacco and tobacco products, weapons and ammunition, shipbuilding (building seagoing commercial vessels on their own propulsion-at least 100 gross registered tonnes), airports, utilities sector and the energy sector, broadband networks, as well as business entities in difficulties. Please, find application form here. Those that terminated the contract for state grants. Companies are exempt from Corporate Profit Tax for a period of 10 years starting from the first year in which they report taxable profit if they invest an amount exceeding approximately €9 million in fixed assets, and employ at least 100 additional employees throughout the investment period. The tax loss stated in the tax return can be carried forward and offset against future profits over a period up to 5 years. Starting from July 1st, 2014 new employment entitles employers to a sizable relief of taxes and contributions paid on net salary from the moment of employment until December 31st, 2017. For non-Serbian citizens, the annual income is taxed if exceeding the amount of threefold the average annual salary in Serbia. The tax rate is 10% for the annual income below the amount of 6 times average annual salary in Serbia, and 15% for the annual income above the amount of 6 times average annual salary in Serbia. The taxable income is further reduced by 40% of an average annual salary for the taxpayer and by 15% of an average annual salary for each dependent member of the family. The total amount of deductions cannot exceed 50% of the taxable income. Income generated through commercial activities in the Free Zones in Serbia is exempted from Value Added Tax. There are twelve Free Zones, currently operating in the country: Pirot, Subotica, Zrenjanin, FAS Kragujevac, Sabac, Novi Sad, Uzice, Smederevo, Svilajnac, Krusevac, Apatin, Vranje, Priboj and Belgrade. Foreign companies can establish a privately-owned Free Zone based on the project approved by the government. Foreign investors in Serbia can enjoy the benefit of customs free import of raw material and semi-finished goods for export oriented production. This benefit can either be achieved by operating in one of the free zones in Serbia or by a permit from custom office for outward processing production. In both cases finished products must be 100% designated for export. Foreign investors are exempt from paying customs duty on imported equipment and machinery which represents the share of a foreign investor in a capital of a company in Serbia. Other local fees exemptions or deductions (e.g. the fee for displaying the company’s name).